The demand for wall tiles increased rapidly in the later 19th century. One of the most popular uses of tiles was in conjunction with fireplaces. While tiles had been used in this way for centuries, the new cast-iron grates that began to appear in this period were specifically designed to be set with tiles, which were fitted to metal panels that bolted onto the frame. 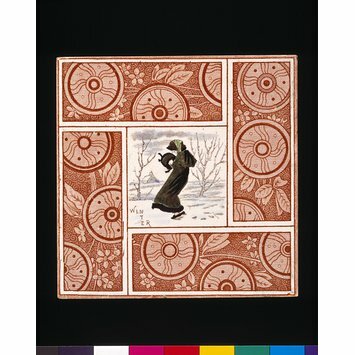 Pictorial tiles were especially popular for this purpose, and many series of picture tiles were produced. The mass production of tiles was greatly facilitated by the invention of dust-pressing in the 1840s. In this process tiles were formed by compacting powdered clay under high pressure in a screw-press. As many as 1,800 tiles a day could made on a single press, operated by two people. As well as increasing the speed with which tiles could be made, dust-pressing also ensured that a consistently high-quality product was achieved, much less prone to warping. The perfect regularity of this example is typical of tiles made in this way. Many tile designs have similar qualities to contemporary book illustration, and indeed many designers produced work for both books and tiles. One of the most celebrated children's book illustrators of the period was Kate Greenaway, who became well known for her drawings of children in period costume. 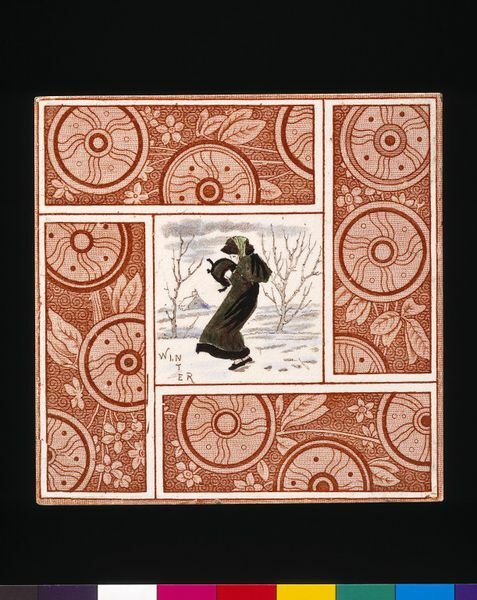 The style of the figure on this tile is close to that of Greenaway, and it is likely to have been her work.